Miuzei Rapsberry Pi 3 Model B+ Case with Fan and 3 Pcs Heatsinks for Raspberry Pi 3 B+, 3 B, 2, 2 Model B by Miuzei at Pacs BG. MPN: MC14. Hurry! Limited time offer. Offer valid only while supplies last. 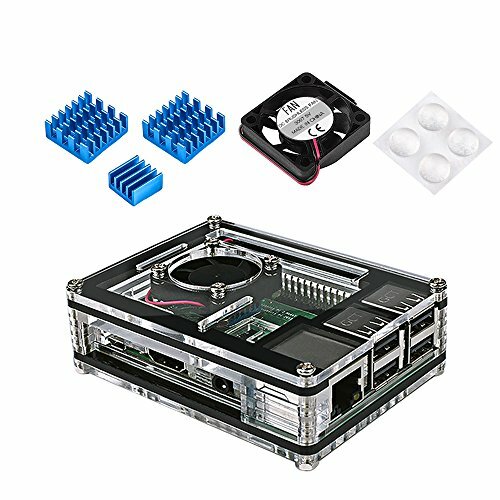 This is 2018 new designed 9 layers case for raspberry pi 3 model B+, also could compatible with raspberry pi 3b / pi 3 model b/ pi 2 / pi 2 model b. This is 2018 new designed 9 layers case for raspberry pi 3 model B+, also could compatible with raspberry pi 3b / pi 3 model b/ pi 2 / pi 2 model b. Special design is easy to insert/remove SD card, allows Breakout cable, HDMI cable and other ports for RPi access. The mute mini cooling fan and aluminum heatsinks have stronger heat radiation while the pi board working. The raspberry pi 3 case with clear acrylic layers is more durable to protect your RPi board! Clear case is easy to watch the internal state while pi board working to check if all electronic components function normally. (1) Small components inside, please away from young kids below 3yrs. (2) Kindly to know this case can't fit for ASUS tinker board. If you have any questions about this product by Miuzei, contact us by completing and submitting the form below. If you are looking for a specif part number, please include it with your message.